My dad, a lifelong Dodgers fan, turned 64 last week. I missed him on the day itself, so left a birthday voice mail with generic good wishes and a call back request. I steered clear of talking baseball, given LA's huge off-field issues with the McCourts and their looming, uncertain off-season. Fast forward to last night, when my voice mail chirps with a response. Dad spent three seconds catching me up on the home front ("All is good here! Hope it's good there!") and then charged right into a recap of the Dodgers' supposedly lame-duck September, when they went a stellar 17-9. "So first we knocked those evil Giants out of the picture and then gave those snakes (i.e., Diamondbacks) something to think about. Should've done more of that in July, but we'll take what we can get. And let me tell you about Matt Kemp..."
I think dad's ready for Spring Training 2012. Wes "Mr. Steady" Parker turned in his own Matt Kemp-caliber season in 1970 by knocking around NL pitching (in a pitcher's park, during a pitcher's era) to the tune of a 133 OPS+ and finished fifth in MVP voting behind HOFers Johnny Bench, Billy Williams, Tony Perez, and Bob Gibson, not the worst group of guys to lose out to. I'm a fan of Topps' multitasking cartoons, but they got the glove hand wrong, since Wes throws with his left. 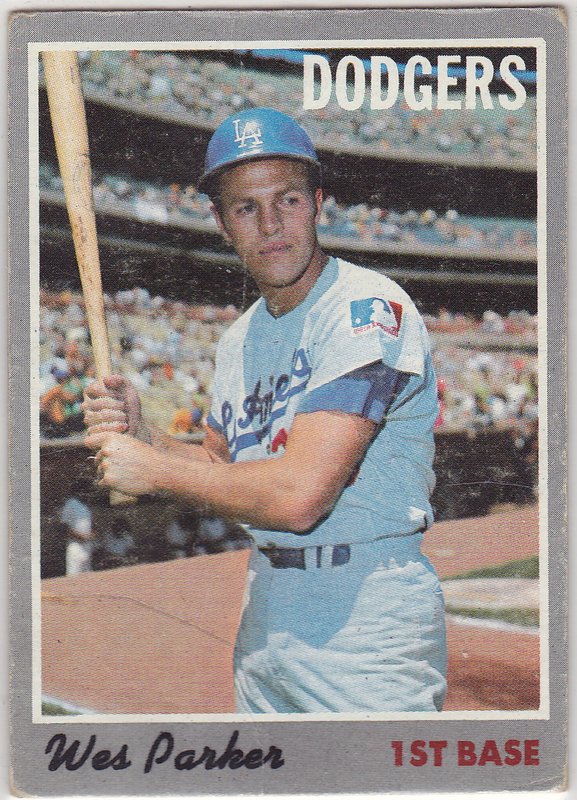 That, and 1969 produced a third Gold Glove, not the second. He grabbed six straight from 1967-72. That's two errors on one card back. Not very Wes Parker-like! 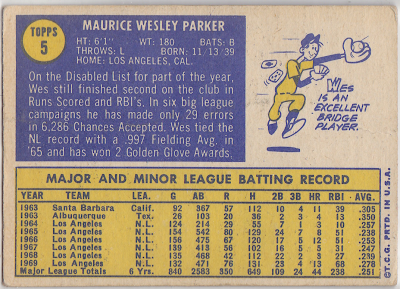 UPDATE: I also used this Wes Parker to design my own custom 1970 Topps card. Value: 1970 non-star singles cost about a quarter. 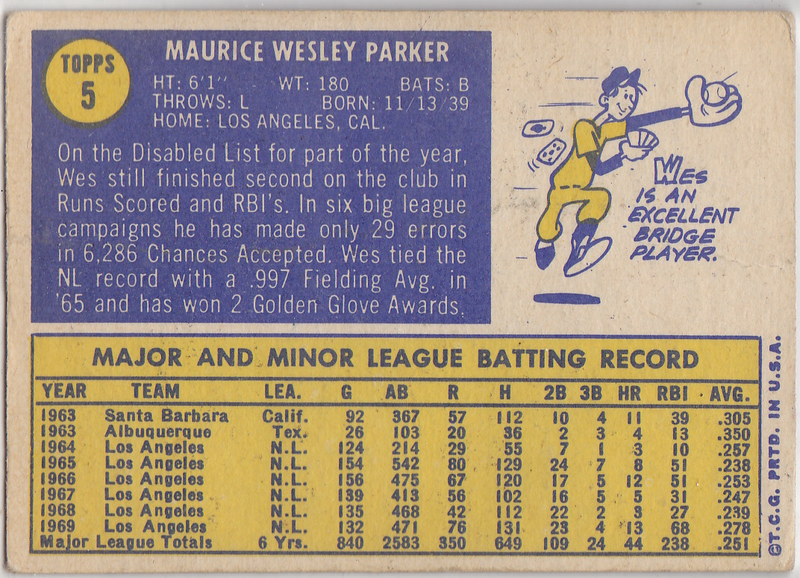 Fakes / reprints: Topps reprinted stars from this set as vintage-style inserts for modern sets, so look for their glossier finish and "Archives" stamp to avoid confusion. Love that card. It's on my wall as we speak, in fact! Good choice! Love this set's cool gray borders, too.